Is waiting for the right opportunity worth it? As a leader, what message are you sending? How Much Trouble is the Economy Really In? When it comes to the study of leadership, you could read a new book every day for the next 181 years and still not get through the list on Amazon alone. As a school of thought we have leadership styles, leadership strategies, leadership studies, leadership indexes, you can even get your Ph.D. in leadership from prestigious universities. Venerable organizations espouse leadership training for children, students, teens, adults, executives, and the would be leader. This is just personal leadership. Then we have brand leadership, corporate leadership, product leadership, innovation leadership, technological leadership, political leadership … and the list goes on and on and on. In days of old, a standard was a conspicuous object (as a banner) formerly carried at the top of a pole and used to mark a rallying point especially in battle or to serve as an emblem for the people’s leader. Today, the more common use of the word “standard” is something established by authority, custom, or general consent as a model or example to be followed. Either way a standard is a hallmark of leadership. You are only a leader when others choose to follow you. Looking at the picture, can you identify the leader? Is it the tall girl that the others look up to? 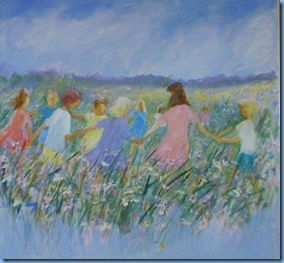 Or, perhaps, it is the small golden haired boy who is pulling the others forward with both hands. Not sure? Could it be the leader is somewhere in the middle of the line, a point of connection leading the group forward? We’ll never know. That is the beauty of art. It is all about perception. The same can be said of leadership. Leadership is not about what you say. It is the result of what you do. Whether we are talking about personal leadership, team leadership, corporate leadership or any other form. Leadership is not about what we say. Leadership is about the results of what we do. Leadership is granted when others choose to follow and the key to that choice is reliability. You see, reliability means that the result is not just visible and measurable, it is repeatable. Those that choose to follow you, buy from your company, or adopt your technology can count on a level of consistency, quality, and reoccurring results over time. How can we establish ourselves as reliable leaders? The answer is reflective of two words: evidence and experience. In the early stages of making the choice to follow, employees, teammates, customers, or partners look for evidence that you do what you say you do on a repeated basis. If they find evidence that you are what you say you are and this is what they are looking for then they may choose to follow for a time. But the true test of leadership is not how many choose to follow, or buy or adopt. The true measure of success is how many choose to stay. That’s where experience comes into play. Once I am a follower, a teammate or a customer, will you as a leader continually deliver on your promise of leadership. Will you do what you say again and again and again? Can those that you lead depend on you to deliver? If the answer is yes, then you are on your way to building your business or your personal leadership brand on a standard of reliability and the right people will follow. So keep on reading those leadership books, taking those classes, and refining your skills. They all can help in the quest for better leadership. But at the end of the day, it all comes down on reliability. A leader that can be counted on is a leader that others will follow and keep following. An entrepreneur, author, speaker and corporate advisor, Joan Koerber-Walker’s journey has spanned from corporate America to entrepreneurship and non-profits, as well as into community leadership and into the halls of Washington D.C. To learn more about leadership and reliability, you can contact her by clicking here.